In September 2015, the world’s governments approved the 2030 Agenda for Sustainable Development and the Sustainable Development Goals (SDGs), a 15-year plan of action for ‘people, planet and prosperity’ (Preamble, UNGA 2015). Realizing the SDGs represents a challenge of enormous proportions. Their emphasis on not only eradicating poverty and hunger but also achieving universal social protection and ‘fundamental changes in the way that our societies produce and consume goods and services’ (para 28) suggests that business-as-usual is no longer an option. Approaches centred on trickle-down economics, jobless growth, corporate-led green economy, fragmented social, economic and environmental policies and targeting the poor through social assistance programmes are inadequate if the ‘transformational vision’ of the agenda is to be realized. 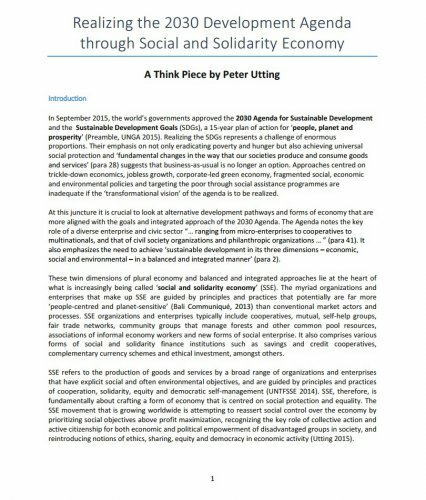 The analysis suggests that SSE should be recognized as an important means of implementation for the 2030 Agenda. The United Nations Task Force on SSE has a key role to play in promoting such recognition. Part 1 examines the relevance of SSE with respect to the means of implementation. It outlines a number of possible actions the Task Force might consider to ensure that policy makers and other stakeholders recognize the relevance of SSE for realizing the 2030 Agenda and what might be done to foster a more enabling environment for SSE. Part 2 examines the concrete ways in which SSE relates to each of the SDGs and targets in the Annex. This think piece identifies key linkages between SSE and the 17 SDGs and selected targets. For ease of presentation, several goals are clustered. Some 67 of the 169 SDG targets that seem particularly relevant for SSE are presented in Annex 1.